This article is about an idea to use the Rows of Chester as a focus for creative businesses, but it starts with a bit of a digression. I’ll get to the point shortly. I studied architecture at the University of Liverpool in the mid-1980’s. Liverpool at that time was at a low ebb; these were the years immediately following the Toxteth riots. Other northern cities would soon start their upward trajectories, but it would be a long time before anyone would want to invest in Liverpool. Nonetheless, the city was an amazing place, and full of potential for an architecture student. I had carried out a number of projects that re-purposed, added to or made use of the rich seam of unused and derelict buildings. So I decided that it was time to fully demonstrate my design skills by designing something completely new. I thought that the south docks might provide a suitable site. Specifically, somewhere in the area between the Albert and Brunswick Docks; perhaps in the location of the later Echo Arena. In all of my projects, I was fascinated by urban repair and wholesale regeneration. But in this case, I immediately ran in to problems. The principal issue being that it just wasn’t realistic to think of designing an expensive new building in the middle of a huge area that was, at the time, essentially barren and cut-off from the city by the four-lane dock road. I persevered with the location but abandoned my ambition to design a swanky new building and instead set out to design something more realistic; something do-able. I thought about how this area might be brought back in to use, and I started to think about the macro and the micro. What things could government do to enable future development and what things could I do, as a soon to be qualified architect, to be a pioneer in the area? The result was a project of two scales. On the one hand, the design of landscaped connections over and under the dock road to reconnect the city to the docks. On the other, the development of a design studio inhabiting the empty, derelict shell of a small dock building. One to facilitate access and connection on a city scale, the other to make a small gesture that said, "well I’m here, why don’t you join me?”. Something on a more human scale. This two-scale thinking, about how to encourage things to happen in cities, has influenced me ever since. What big issues need to be sorted to allow the possibility of things happening; and what can be done at a personal level, to help kick-start some pioneering beginnings? Unlike Liverpool, Chester doesn’t have large areas of post-industrial wasteland, nor does it have a large stock of empty warehouse buildings. These have been key in other cities in allowing the low-cost, informal development of arts and business hubs which, over time, have grown to transform an area. Often these developments have sufficient scale to become ecosystems in their own right, so being located outside the buzz of city centres doesn't matter too much. In Chester, there is a small amount of warehousing along the canal that has all been re-purposed. The goods shed at the railway station sadly burnt down, and nothing has happened in its place. Georgian and Victorian city centre townhouses that provided small office accommodation in the twentieth century are now being converted back to residential use. High-quality offices are built outside the city centre. Poor quality 1960's office buildings in the city centre remain empty and are gradually being demolished over time. 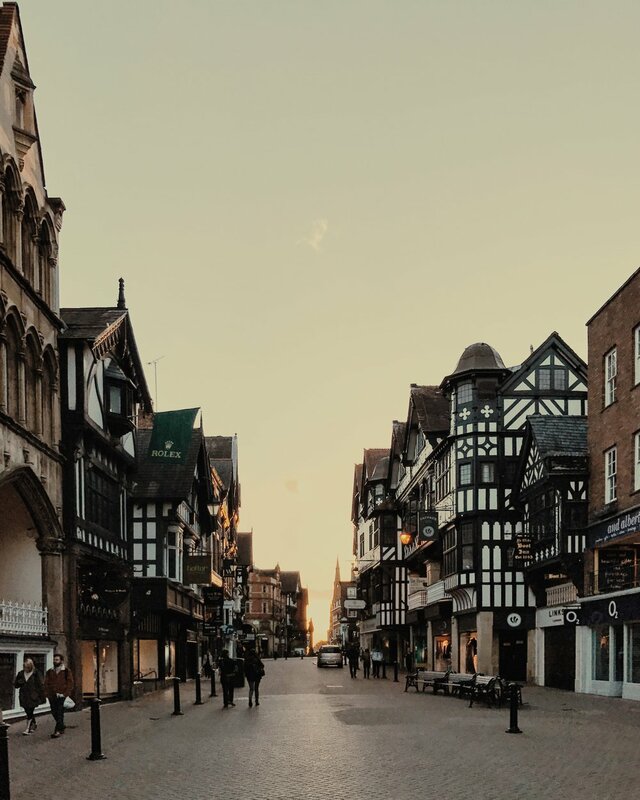 A lack of appropriate low-cost buildings and Chester’s small scale mean that it has been unable to organically develop an effective start-up business hub or centre for creative businesses. The university’s Riverside Innovation Centre is perhaps the nearest equivalent, but this only serves to illustrate that having access to substantial funds doesn’t solve the problem either. But Chester’s unique size and distinctive heritage should be the source of unique and distinctive solutions. In the case of creating an eco-system for small and creative businesses, rather than thinking in terms of a single building, perhaps the answer lies in developing the entire city centre as a creative hub? Where small businesses inhabit the empty spaces above the rows and are connected by that system of covered walkways that only Chester has. That plugs into the cafe and bar culture beneath; a culture that is so vital to the workings of a thriving business community. I’m not suggesting that this is my idea. It may have been, I can’t remember. It’s possible that I pinched it from someone else (for which I apologise). Or it may have been in the ether, ready to be picked up collectively. The origin of an idea doesn’t matter so much as making it happen. That’s where the real challenges lie. And, anyway, it could be argued that the idea already exists. That we do have a burgeoning creative business community in the city centre located above The Rows and in other nearby buildings. That does use The Rows as a connecting corridor so that these businesses can cross-fertilise, interact, network, do business. Yes, it happens regardless. But my point is that what currently exists isn’t yet a thing. And it could be. And the thing could be amazing. Taking something that already exists and making something of it, rather than inventing something new, has surely got to be the way to go in these cash-strapped times? So, when does a thing become a thing? When it is given a name? When it is branded? When it is marketed? When it has a website? When it organises events? When it forms a community? When it is seen to be socially useful? Yes, all of these things, and much more. But most importantly, a thing exists when it takes shape, not so much in physical reality, but in the reality of people’s minds. When people can see it. So how could it happen? Through the macro and the micro of course. By local government and the grassroots jointly wanting it to happen. It would require the local authority to take the initiative; to make use of its own empty buildings; to provide the seed-funding for the small amount of administration that would be required, and to put the infrastructure in place to make it happen. It would require the owners of existing small businesses to come together as a community. Everyone would need to ask themselves, what can I do to make this happen? And it would also require the larger landlords to participate and other larger city centre businesses to support it. What have they got to lose? What might it look like? It would use Chester’s medieval rows as the linking idea, literally and metaphorically. Using the past to create the future. What would be the benefits? It would be unique. A city centre as a creative hub. It would be a contribution to Chester as independent, distinctive and full of character. It would provide a sense of focus and belonging for existing businesses. And to the outside world, it would look like there was something happening. People might say, “There’s something going on in Chester. I’m not sure what it is exactly, but I do know that I like it, and I want to be part of it”. But opportunities can be missed. Potential is temporary. The energy of a place comes and goes. We’re in the middle of our own upward trajectory at the moment: Storyhouse, Good For Nothing, The Food Assembly, Murmurations, BCorp, The Share Shop and the raft of initiatives and people featured in The Chester Blog. This magazine. Can we take full advantage? Are you in? Will you help this thing become a thing? *A note about the term 'creative business': I’m using the term loosely here. I want it to be inclusive and I’m not limiting it to those businesses that are traditionally regarded as making up the ‘creative sector’. It could include all businesses were it not for the fact that, sadly, not all businesses are interested or interesting. This article was written by Andy Foster for the December 2018 issue of Tortoise Magazine. Illustration by the very talented Lauren Kavanagh - check out more of her work here.